Native Americans have a very rich culture littered with struggle, strife and success. Their stories are steeped in tradition, spirituality and closely tied with Mother Nature. 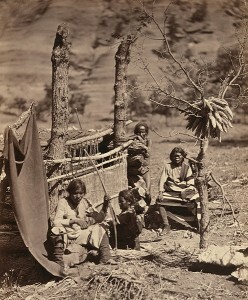 Many aspects mainstream culture are adapted from Native American cultures. Symbols such as the sun on the New Mexico flag are actually taken straight from Native American culture. Other symbols often used are teepees, totem poles, peace pipes, and moccasins. Below are several Native American cultural facts that may help in the understanding of the rich history of Native Americans and the important role they’ve played in shaping modern culture. Everything in Native American culture is considered to contain a spirit. Everything has ties to nature and is thought through and carefully produced. From native plants and animals to housing to the weather became a part of the culture in Indian life. Animals are revered as spirits and although they were hunted and killed, their skins and hides are used as clothing and drums, their meat is never wasted and their spirits live on in the mind of the tribes. Plants are cultivated and harvested, and used for various things such as dyes for blankets. The rain and sun are considered to be gods, giving a sign to the Indians as the seasons change. Totem poles, large wooden poles carved with various animals are used to represent family members, loved ones who passed away and spiritual beings. People were assigned spirit animals and that are often reflected in the totem pole. Unique to Native Americans, the dreamcatcher developed in the Ojibwe tribe symbolizes holding onto good things in life, while the holes in the catcher are there to filter out bad thoughts and feelings. Dreamcatchers are hung outside homes to catch the bad dreams of young children. Smoke signals were also a very important part of Native American culture serving as a source of communication over long distances. Native American lifestyle can generally be divided into two categories. Sedentary farmers include the Hopi, the Zuni, the Yaqui and the Yuma. These tribes grew crops like corn, beans and squash. They lived in permanent settlements known as pueblos that were built of stone and adobe that resembled something like modern-day apartments. At their centers, many of these villages also had large ceremonial pit houses, or kivas. The other category is nomadic including the Southwestern tribes such as the Navajo and the Apache. Known as hunters and gatherers these tribes survived by gathering and raiding their more established neighbors for their crops. Because these groups were always on the move, their homes were much less permanent than the pueblos. While the nomadic lifestyle is no longer as predominant as it was in the past, the Native American’s deep culture remains intact through their symbols, artwork, traditions and connection with nature. Evidence of the Native American art history impact on everyday life is apparent in jewelry, housing, food and artwork.